Hartmut Bohnacker, Benedict Gross, Julia Laub, Claudius Lazzeroni. 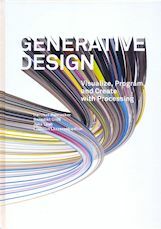 Generative Design: visualize, program, and create with Processing. Generative design is a revolutionary new method of creating artwork, models, and animations from sets of rules, or algorithms. By using accessible programming languages like Processing, artists and designers are producing extravagant, crystalline structures that form the basis for everything from patterned textiles and typography to lighting, scientific diagrams, sculptures, art installations, films, and even fantastical buildings. Generative Design opens with a gallery of thirty-five illustrated case studies, drawn from the work of graphic designers, sculptors, architects, and other visual artists, including Stefan Sagmeister, THEVERYMANY, Janne Kyttänen, Casey Reas, Karsten Schmidt, and Marian Bantjes. A step-by-step how-to manual follows, guiding users through specific, practical instructions for creating their own visual experiments by combining simple-to-use programming codes with basic design principles. A further handbook of advanced strategies provides visual artists with all the tools to achieve proficiency. The entire volume is cross-referenced to a companion website where source code for examples can be downloaded and users can share their own artwork, code, and techniques. Generative Design is the definitive showcase, study, and reference for this exciting emerging field.